Creative peace building, intellectual implementation and collective negotiations have brought home the bacon for many conflict ridden zones around the world. Kashmir, however, still awaits answers and justice after years of unproductive political bankruptcies inside the territory. India and Pakistan both must realise that ignoring Kashmir, as a conflict, will keep the blunt discord alive through periodic violence and political authoritarianism. The Lahore Declaration and Memorandum of Understanding (MoU), signed by then Prime Minister Atal Bihari Vajpayee & Prime Minister Nawaz Sharif, recognised the commitment towards resolving the Kashmir dispute. It was a historic bilateral agreement that rectified the need to minimise the means of terrorism through commitment in dialogue. It also hailed the former Simla Agreement and the Charter of United Nations. Therefore, after thirteen years, the reference point for both national and regional state actors needs to be as coherent as required by the rules of sincere politics. There was a time when Kashmir resolution was fruitful when Agra Summit was beginning to mature between India & Pakistan. Its unsuccessful deliverance was a blow to Kashmiri people because the common people lost yet another case for seeking their collective aspirations. During the last elections in Kashmir, some of the media and journalists were hailing the resilience of Kashmiri people because they saw the voting turnout as a tool towards the conflict resolution, soon after the mass demonstrations against the state. When Kashmiris protested against the Amarnath land row in 2008, all Indian mainstream party actors in Kashmir in media debates recognised the fact that pro- freedom camp in Kashmir was a force to deal with, and a party towards the resolution for Kashmir dispute. Suddenly, as confidence building measures between two countries started declining, due to acts of violence in other Indian states, they slowly started sidelining the Kashmir dispute and recognised elections and economic grants as the only forward looking vision. The reality is that the failure of national co-operation between two countries due to political instability inside Pakistan, and negligence of mediation at international level from India, increased failures in building confidence measures for any peaceful negotiation. Acts of major violence can only be stopped through peaceful negotiations of important issues. 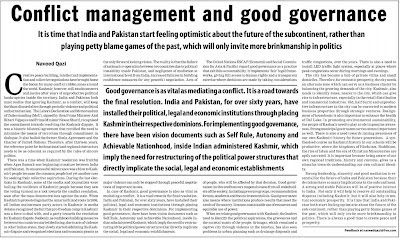 In case of Kashmir, good governance is also as vital as mediating a conflict. It is a road towards the final resolution. India and Pakistan, for over sixty years, have installed their political, legal and economic institutions through placing Kashmir in their respective dominions. 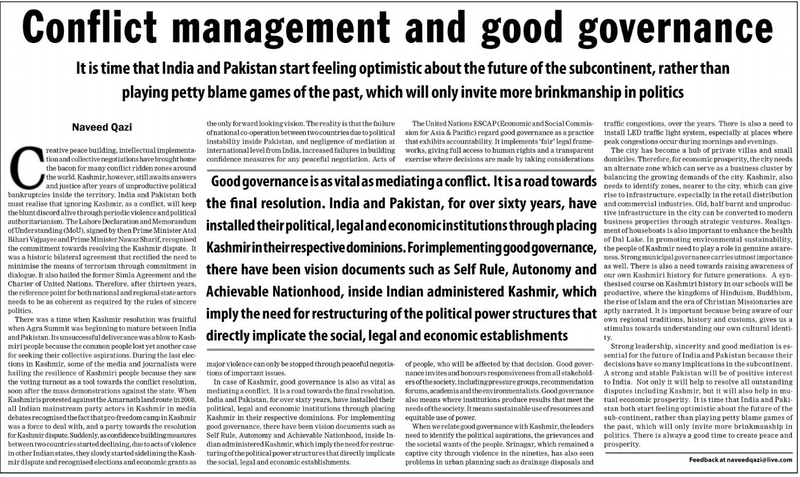 For implementing good governance, there have been vision documents such as Self Rule, Autonomy and Achievable Nationhood, inside Indian Administered Kashmir, which imply the need for restructuring of the political power structures that directly implicate the social, legal and economic establishments. The United Nations ESCAP (Economic and Social Commission for Asia & Pacific) regard good governance as a practice that exhibits accountability. It implements ‘fair’ legal frameworks, giving full access to human rights and a transparent exercise where decisions are made by taking considerations of people, who will be affected by that decision. Good governance invites and honours responsiveness from all stakeholders of the society, including pressure groups, recommendation forums, academia and the environmentalists. Good governance also means where institutions produce results that meet the needs of the society. It means sustainable use of resources and equitable use of power. When we relate good governance with Kashmir, the leaders need to identify the political aspirations, the grievances and the societal wants of the people. Srinagar, which remained a captive city through violence in the nineties, has also seen problems in urban planning such as drainage disposals and traffic congestions, over the years. There is also a need to install LED traffic light system, especially at places where peak congestions occur during mornings and evenings. The city has become a hub of private villas and small domiciles. Therefore, for economic prosperity, the city needs an alternate zone which can serve as a business cluster by balancing the growing demands of the city. Kashmir, also needs to identify zones, nearer to the city, which can give rise to infrastructure, especially in the retail distribution and commercial industries. Old, half burnt and unproductive infrastructure in the city can be converted to modern business properties through strategic ventures. Realignment of houseboats is also important to enhance the health of Dal Lake. In promoting environmental sustainability, the people of Kashmir need to play a role in genuine awareness. Strong municipal governance carries utmost importance as well. There is also a need towards raising awareness of our own history for future generations. A synthesised course on Kashmiri history in our schools will be productive, where the kingdoms of Hinduism, Buddhism, the rise of Islam and the era of Christian Missionaries are aptly narrated. It is important because being aware of our own regional traditions, history and customs, gives us a stimulus towards understanding our own cultural identity. Strong leadership, sincerity and good mediation is essential for the future of India and Pakistan because their decisions have so many implications in the sub-continent. A strong and stable Pakistan will be of positive interest to India. Not only it will help to resolve all outstanding disputes including Kashmir, but it will also help in mutual economic prosperity. It is time that India and Pakistan both start feeling optimistic about the future of the sub-continent, rather than playing petty blame games of the past, which will only invite more brinkmanship in politics. There is always a good time to create peace and prosperity.